The 'Wild Wisdom of the Faery Oracle' is your doorway into the magickal realm of the Faery. Each gloriously illustrated card is brimming with secrets, messages, insights and guidance directly from the most helpful and wise of nature's guardians, delivering clear messages and direct and loving guidance. Easy to read, yet deep, mystical and rich, the 'Wide Wisdom of the Faery Oracle' includes an in-depth guidebook revealing the secret lore of the Faery realm as well as clear lessons on how to connect, create and nurture deep relationships with your own Faery guardians and allies. The included card layouts allow you to give powerful, insightful and accurate readings for yourself and others. When you connect with the Fae, their powerful natural magicks can assist with healing and enhancing your health, activating vivid psychic abilities, gaining insight and direction within your relationships and awakening your innate connection to abundance. Your life then becomes an inspirational experience, full of meaning and joy. Your own ability to see, sense and feel the Fae accurately will grow stronger and clearer each time you work with this enchanted, inspiring deck, steeped in authentic, deep Faery magicks. 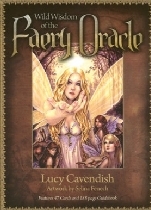 Lucy Cavendish is a natural white witch who works with the elemental and celestial realms. She works magic every single day of her life, embracing it as a creed for personal fulfillment and happiness, and as a belief system that sees us as part of nature, and this gives us all the motivation to respect and revere and delight in our unique experience here on Plant Earth. Lucy is the author of "The Oracle of the Dragonfae", "As Above", "So Below", "The Oracle Tarot", "Magical Spell Cards" and "White Magic". Her work has been enjoyed and recommended by beings as diverse as Deepak Chopra, Louise L. Hay and Fiona Horne. Lucy Cavendish created "Witchcraft Magazine" in 1992, the first magazine of its kind in the world. She is a feature writer for "Spellcraft Magazine", "Spheres", and has appreared in anthologies like Disinformation's "Pop Goes The Witch"! She appears regularly on mainstream and alternative television and radio, explaining the Craft and demonstrating magicks and the power of intuition. She is a founding member of the Goddess Association in Australia. Lucy Cavendish lives in Sydney, Australia, with her pixie-like daughter and their menagerie of plants, animal companions, spirit beings and beloved elementals. Selina Fenech Once Upon a time, on the night of a full moon in a small country town in Australia in 1981, a girl was born with a vast imagination. She was given the name Selina, meaning 'Moon', named after the moon that shone that night. As a child Selina loved to read. Her favourite stories were those of myth and magic, princesses and fairies. She soon learned she had a greater love than reading when she would spend countless hours staring at the illustrations in these books, ignoring the stories told in words in preference to the stories shown by the artwork. She would study each brush stroke, marveling that any human hand could create such beauty. The images enchanted her, bewitched her and filled her head with magic and romance. Having always enjoyed drawing, Selina began to create artworks of her own ideas of fantasy, inspired by the illustrations in her fairytale books with goddesses, fairies and enchanted creatures, continually trying to improve and create the same magical feel and sense of adventure she knew as a child. Many years later, Selina's artwork has been warmly received by lovers of fantasy all over the world. Selina still resides in Australia, selling her artwork and handcrafted gift designs through her website. Her art has been published in books and magazines worldwide and is available on licensed products ranging from t-shirts to stationery, figurines to jewelry. Her art has been purchased by customers and collectors in over 30 countries.